HomeSmartphonesAndroidHow will Kotlin supersede Java? 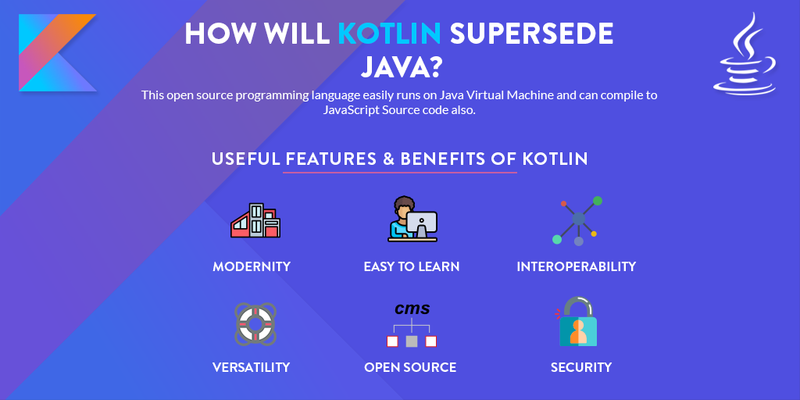 Java and Android association is well known and well applied by almost all app developers but now what is intriguing them more is the launch of new programming language, Kotlin. Following the announcement of the same by the CEO of Google and his team in mid-May this year, the Android developers are considering it as a great opening for tremendous new opportunities. Modernity: Kotlin has all the features of a modern language which as an app developer you would long for. It has safe a Lambdas and Method references for clean connections between parts of your App, safe Nullability system, a built in Mutability/Immutability property system, a clean and easy to use Stream operators(filter, map, reduce..), and many more to simplify your development efforts. It approximately requires 20% less coding than Java and thus enhances the development speed of app developers. Open Source: Kotlin supports the open developer networks and the strength of open source makes the network strong which is not restricted to any single company. Efforts are made to target other platforms also as the language is precisely built to run on the native code on Macs and iOS as well. Interoperability: The biggest advantage of this language is its interloper with Java. You can use the Java libraries and frameworks in your new Kotlin project without changing the entire project into Java. You can even use Kotlin features in the existing Java project. Thus, with emitting of Bytecode the bridge between both the languages is built and compiling a project using Java and Kotlin together has become a possible task now. Versatility and security: Kotlin is a most competent language with its rich features like built-in null checking, highly compatible with Java code, extension methods to add new functionalities to existing classes and many more. It is specifically designed to autocorrect mistakes, in case you have checked a type as a right and helps developers to avoid errors. Easy to learn: The simplicity, compatibility, and modernity of this language make it possible for developers to learn it quickly and easily. It is available with lean and institutive syntax enabling even a fresher to grasp it effortlessly. The easy debugging while writing app code further make the app development process interesting and faster. We are living in the world where change is the only constant. The platform, technology, programming language, everything is changing rapidly in the mobile app development world and if you take my advice then there is no harm in switching to this excellent, fast and performance-oriented language. Besides, the benefits stated above, it is easy to work on it along with Java and C++ on Android. Thus, just make your Android app development process more fun, boost it and write effectively with fewer bugs in code.